The Bank of America Business Advantage Cash Rewards Mastercard is great for businesses that primarily spend on fuel and office supplies, as well as for companies that qualify for Business Advantage Relationship Rewards. Generous 3% cash back for up to $250,000 in combined fuel purchases and purchases at office supply stores per calendar year. The 0 percent APR promotional period is shorter than competitor offers, including Chase’s Ink Business Cash Credit card, which offers a 0% APR for 12 months. Is the Bank of America Business Advantage Cash Rewards Mastercard Right for You? The 0% introductory APR, lack of an annual fee, and competitive standard APR make the Business Advantage Cash Rewards card an inexpensive option compared to similar alternatives. Extra rewards for gas, office supplies, and restaurants mean your company can quickly rack up the rewards if you spend in those categories. 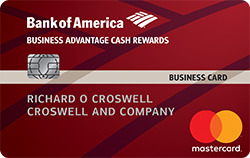 The card is also ideal for companies with other Bank of America accounts because of BOA’s Business Advantage Relationship Rewards. These provide the opportunity for added rewards if your business has money invested in BOA accounts. Of course, this Bank of America business credit card isn’t the best choice for everyone. If you don’t have other funds with BOA and spend most of your money outside office supply stores, gas stations, and restaurants, this likely isn’t the card for you. This Bank of America business credit card offers a number of flexible benefits and rewards to small business owners. The Business Advantage Cash Rewards Mastercard offers a generous $200 sign-up bonus after spending just $500 within 60 days of account opening — so the bonus is easy to claim. Although the Chase Ink Business Cash Credit Card offers a bigger $500 bonus, you’d need to spend $3,000 within three months of opening the account to get it, so it might be out of reach for some small businesses. The card offers a generous 3% cash back on gas and purchases at office stores, as well as 2% back on restaurants. You’ll get a standard 1% cash back on all other purchases. If you operate a web-based business without a lot of transportation or office expenses, these rewards might not work for you. But these spending categories are well tailored for most traditional small businesses. Additionally, Bank of America’s Business Advantage Relationship Rewards program presents the opportunity for even more rewards. If you maintain a three-month average combined balance of $20,000 across all Bank of America accounts, your business will receive a 25% rewards bonus. If you have at least $100,000 across all Bank of America accounts and qualify for platinum honors-level rewards, you’ll get a 75% rewards bonus and additional rewards on merchant service processing, a 20% interest rate boost on business savings accounts, and discounts on business auto loans, lines of credit, real estate loans, and more. If your spending habits don’t match up with the card’s rewards bonuses and you don’t qualify for Relationship Rewards, the rewards program is the biggest downside of the Advantage Cash Rewards Mastercard since you earn just 1% cash back on most purchases. The standard variable APR, while competitive, also isn’t the lowest across all business cards, and competitors such as the Ink Business Unlimited credit card offer a longer 12-month 0% intro APR, which also applies to balance transfers. The Business Advantage Cash Rewards Mastercard offers less cash back on most purchases than many competitors, including Spark Business by Capital One. However, many cards with higher cash rewards have annual fees and don’t offer added cash back on gas and office supplies. Ink Business Cash by Chase does provide 5% cash back on purchases at office supply stores, as well as on Internet, cable, and phone service, but not gas, which only earns you 2% rewards for buying, so you’d need to examine where your small business does most of its spending. The Ink Business Cash matches the Business Advantage card’s 2% cash back on restaurants. However, it caps the bonus 5% cash back at just $25,000 in spending — 10 times less than the $250,000 limit set by Bank of America. If your small business has banking relationships with Bank of America and you can qualify for bonus rewards and other perks with Relationship Rewards, the Business Advantage Cash Rewards card is a great choice. If you don’t bank with Bank of America and aren’t spending most of your money on gas or office supplies, look elsewhere for a card that provides better than 1% rewards for the purchases you most often make. Compare the best credit cards reviewed by LendEDU to see if another card meets your needs.